Great blogpost by Davide Lanfranco about how important education and advice is for our profession! It is the foundation of the treatment. Davide Lanfranco is an italian physiotherapist and hypnotherapist living and working in central London. Davide has a big interest in pain management and in anything related to it. His approach is specifically tailored on patients’ necessities and includes manual techniques (physiotherapy and osteopathy) and hypnosis (to manage any kind of pain and to restore the correct motor imagery). He is truly conviced that the key to be a good physiotherapist is never forget that you are treating a person and not a pathology. 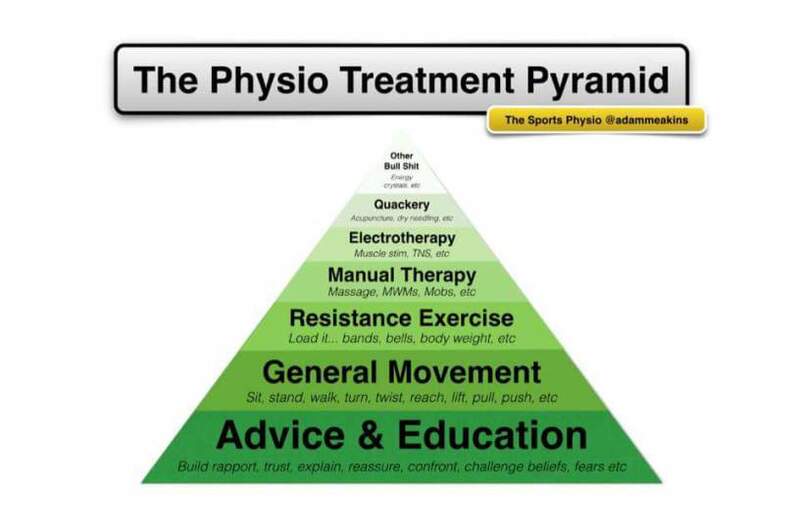 The rapport between the physiotherapist and his client is the key for a successful outcome. Understanding clients’ beliefs and expectations and planning a therapeutic approach based specifically on that individual are fundamental to solve the problem. “A well designed Randomised Controlled Trial (RCT) regarding acute WAD, demonstrated recently that 6 sessions of multimodal physiotherapy (advice, exercise, manual therapy) were slightly more effective, but not on a significant level, than just one physiotherapy session that focused mainly on offering advice (Lamb et al., 2013). Bloody hell! It is the first thing I thought when I read it. Basically it is saying that education & advice are as important as the treatment. Unfortunately there are a lot of practicioners who spend thousand of pound in courses, medical instruments and electro-medicals and loose the contact with the most important part of our job, the foundation of our profession: EDUCATION AND ADVICE. I mean trying to understand patient’s beliefs (regarding the issue) and expectations (regarding the rehabilitation) and to use them in order to get a successfull outcome. As Prof. Lorimer Moseley said: “Anything that changes your brain’s evaluation of danger will change the pain”. Most of the patients come to the initial assessment very scared and worried, especially after road traffic accident. Few days ago a client of mine told me: “I cannot believe I can feel so much pain at this age: I damaged something”. Middle age people are very concerned about the MRI and XRAY findings. Expressions like “degenerated spine”, “degenerated discs”, “bulging”, “osteoarthritis” , “sprained ligaments” etc.. are all expressions that poison the mind of the client making him think that there is a certain connection between the physical damage and the pain he/she is experiencing. “So if my spine is degenerated how can I get better? Am I doomed to pain for the rest of my life?” that is what lot of people ask me at the initial assessment. Until you don’t change these beliefs there is no way to make him/her feeling better. That is why, as my friend Giancarlo Russo says, if you approach the client in the right way and if you communicate properly 90% of the job is already done; what you do on the treatment couch is not so important anymore. However, there cases in which it is impossible to change people’s belief. If you treat a 70 years old client with pain on the left sacro-iliac joint is very difficult for that person to accept the idea that the site of the pain is not where the problem is. It is difficult for that person to accept the idea that if you treat the thoracic spine and the diaphragm the pain will calm down. In this case if you don’t manage to change his/her beliefs you have to be smart and to use them to fix the problem. A 10 minutes massage on the painful area will be enough to make the client happy and to get “potential” on him/her (we will explain this topic in another post) and you will still have time enough to do all the techniques that you believe are necessary. Treatment is very important but it becomes meaningless without the initial interview. On the other side a profitable interview could be not enough without a proper treatment. I don’t really know what a “proper treatment” is, I can just tell you that, with the right advice and education even a normal massage could be enough to fix a non-specific-low-back pain or a non-specific-neck pain. You can spend thousand of euro, quid or bucks in courses with pretentious and exotic names but, if you are not able to deal with people, to approach them properly and to give the right advice you will not go any further: you will always be a mediocre therapist.